I can no longer recall how, but I came into possession of a Legoland California park map sometime in the last fifteen years. The old map is worn and creased, a souvenir from my unremembered benefactor's day at the park. I looked at it from time to time over the years and tried to imagine what the park would actually look like. But for as curious as I was, it was never that high on my list of vacation destinations. At least, until I had a daughter. 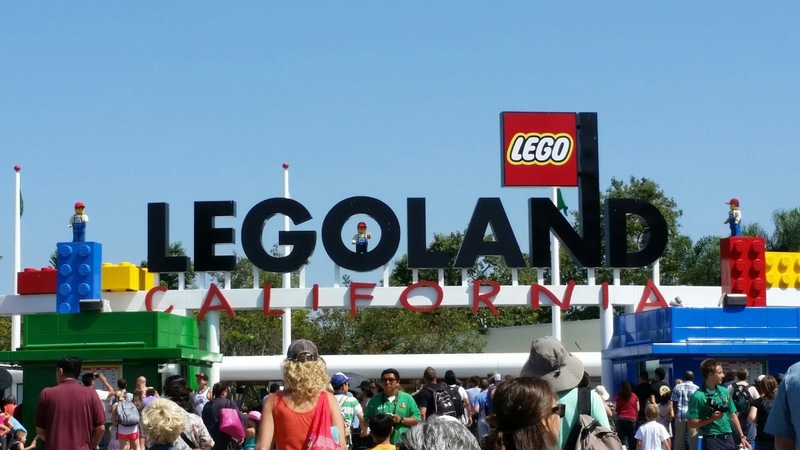 The entrance to Legoland California. My wife and I decided that we had waited long enough and it was time for a family vacation. Since we already held annual passes for the San Diego Zoo, it seemed prudent to plan a vacation around that area. My wife also loves the ocean, so that narrowed the options. And then, we remembered that Legoland is in that vicinity and our choice was settled. After a day in the zoo, we set out early Wednesday morning to explore this new-to-us theme park. 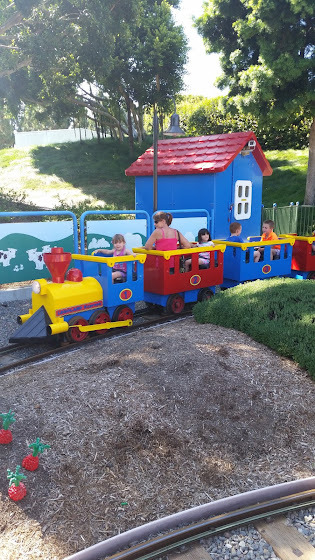 I had been warned long ago that Legoland is a park that pitches its attractions much younger than Disneyland. Still, I was still shocked at the number of rides that our daughter was too short to ride. Making a right hand turn from the entrance took us into what seems to be the newest section of the park. Several of the attractions we ran across required her to be at least forty inches tall. The smartest thing in the world. Of course, a little exploration led us to rides more her size: a cute little airplane ride, a swinging pirate ship, a Dumbo-like flying plane ride. In the Adventure zone, we found Legoland's version of a light-gun dark ride, Lost Kingdom Adventure. Castle Hill held the Royal Joust, a kiddie ride on a Lego horse. Our daughter enjoyed working out her energy in the Duplo play area. Our favorite area was probably Explorer Island, with the Safari Trek, Coastersaurus, and Fairy Trail Brook. Our daughter enjoyed the boat ride so much that she insisted that we ride it again the next day. The best thing that stood out to me were the play areas built into a couple of the ride queues to entertain waiting children. 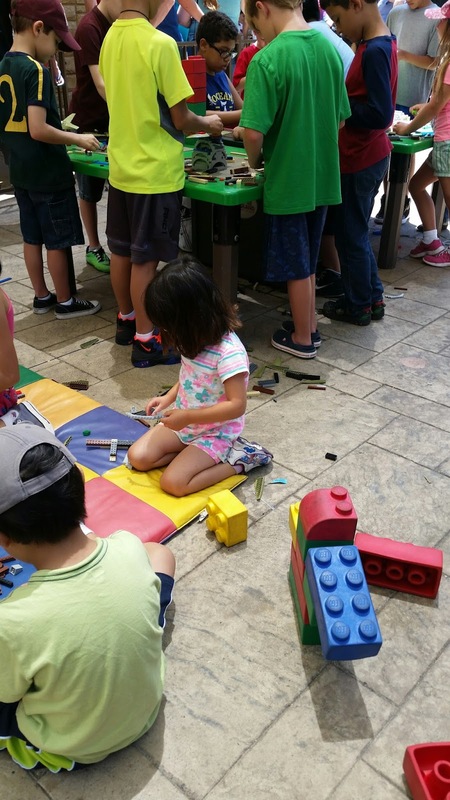 It was nice to let our daughter play and build Lego while we waited for the line to move. If there was one idea I would import into the Disney parks, it would be that. Trains are magic, no matter how large or small. On Thursday we visited the water park and aquarium, much to our girl's delight. Legoland was interesting. Not a place I intend to visit often, but I can see us returning in a few years' time to maybe revisit some of what we missed the first time. Over in the Family section of The Orange County Register, staff writer Kedric Francis posted an article titled "10 ways to improve Disneyland". As I am a blogger and it is my nature to respond to articles like this when I have nothing else to write, let's examine the list and see how much of it makes sense. Go locavore - When a writer just has to make a list of ten items, this is the kind of thing that's likely to crop up. Only the fact that my daughter likes raisins keeps me from laughing the entire suggestion off. Verdict: Sure? So, four good suggestions and one that seems okay. What would you like to see improved at Disneyland? While driving to her day care last week, my daughter suddenly told me, "It was really great that we got to see Disney Junior." I should not have been as shocked as I was. She is growing up quite fast and constantly surprises me with how much she has learned and how fast. But here I was talking about one of my favorite topics, Disneyland, with my daughter. I decided to prod her a little to see just how much she remembered. I asked, "What was your favorite part?" She answered, "When Stuffy made all the bubbles in the sink." She was right; that was a lot of fun. My wife and I have long been fans of Disneyland. We had annual passes for a few years until it was no longer feasible. But we never stopped loving the parks. When we had a child, I knew that I would want to share so much with her. I should have guessed that it would be Disneyland that caught her attention. Disney is already a big part of her life. She loves watching Disney Junior in the evenings, especially Miles From Tomorrowland with its catchy theme song. We read Disney books before bed. And, of course, she is in love with the Disney Princesses. Prior to her birth, her mother and I talked and planned about how we would encourage our daughter to find some aspiration other than "Princess". We bought books and toys and clothes that cover a variety of tastes. When she was old enough, we enrolled her in soccer and swimming classes. We did everything we could to expand her horizons. In spite all of that, she is a princess. But, she is a princess in addition to everything else she is. She's a storyteller. She can climb and run and kick a ball. She loves her books. And she loves dresses and she loves pink. For as much as I worried, being a princess is not some terrible, anti-feminist affliction. It is just another facet of her life. So long as it makes her happy and doesn't cause any harm, she can be a princess for as long as she wants. Theme Parking is a new category for posts related to my lifelong obsession with Disneyland.